Fragrant Flower is a key item in Sekiro that you’ll need to give Lord Kuro to make the Fountainhead Incense. Finding the Sekiro Lord Kuro flower is no easy feat. There are NPCs to talk to, bosses to kill, and more. If you’re having trouble figuring out where to find the Flower for Lord Kuro, then our Sekiro Flower for Lord Kuro Incense Location guide is the right place for you. We’re gonna show you where you can find the Fragrant Flower, how to get it, how to start the quest, and how to use the item. But first, I’m just gonna go ahead and put a huge SPOILER WARNING. This guide is going to mention some late-game content. If you don’t want it spoiled, best come back later. Where to Find Fragrant Flower for Lord Kuro in Sekiro? To find the Fragrant Flower for Lord Kuro in Sekiro, you’ll have to go to Sunken Valley, battle a Guardian Ape in a shallow lake, and find the flower in a small cave near the Sculptor’s Idol. This is only available if you choose to side with Lord Kuro, abandon the Iron Code, and battle the Great Shinobi Owl. If you get the Shuro ending, you won’t be able to complete the quest. Go speak with Lord Kuro after killing Genichiro, then talk to Lord Isshin about the Mortal Blade, then go back and talk to Lord Kuro. Ask him about the flower, and you’ll find out more about the Fragrant Flower item. Also, pick up the Gun Fort Shrine Key from behind Kuro. With that out of the way, go to the Gun Fort idol in Sunken Valley, and go downwards, to the lair of the Long-Arm Centipede Giraffe. If you haven’t beaten the boss yet, you’ll have to do so now. Go to the door behind the statue, and unlock it with the Gun Fort Shrine Key. Go onto the bridge, and the goddamn snake will immediately attack and drop you into the water. Turn right and swim for your life. Your goal is the small, candlelit passageway. Once you go inside, the snake can no longer harm you. A few steps further, you’l find the Riven Cave Sculptor’s Idol. Look up from the idol, and you’ll spot grappling points, so get up to the small passageway, and proceed to the cliff edge. Turn left, and climb up the ledges. Use the two Buddha statues to get across the chasm, and drop down from the statue with clasped hands. Proceed to the fallen statue, and then into the huge gaggle of monkeys. You can fight them, or make a run for it to the left. Grapple onto the statue’s extended hand, and hop onto the rope-like ledge. Walk over it and jump towards the Bodhisattva Valley Sculptor’s Idol on the left below. There’s an NPC behind you that you can talk to. However, you want to proceed forward, into the shallow lake, and towards the Guardian Ape boss. How to Get Lord Kuro Fragrant Flower in Sekiro? To get the Fragrant Flower item in Sekiro, for Lord Kuro and the Fountainhead Incense, you’re gonna have to kill the Guardian Ape. Keeping your distance is key to winning here, because the Ape has a huge range, but if you come too close, he can grapple you, deal poison damage, and even chuck his poop at you. Use your Firecrackers; they’re very useful here. In the second part of the battle, keep evading until the Ape drops to the floor. Jump over the attack he does from the floor, get one or two attacks in, then keep doing that. After you manage to kill the Guardian Ape, look around the pond you’re in, and find the idol. That’s the Guardian Ape’s Watering Hole idol, and you should activate it in case you need to return fast. To the left of the idol, you’ll find a tiny entrance leading into a small cavern. At the end of said cavern, you’ll find the flower. The item is called Lotus of the Palace. The cavern is enemy-free, so take a breather. How to Use Sekiro Lotus of The Palace? 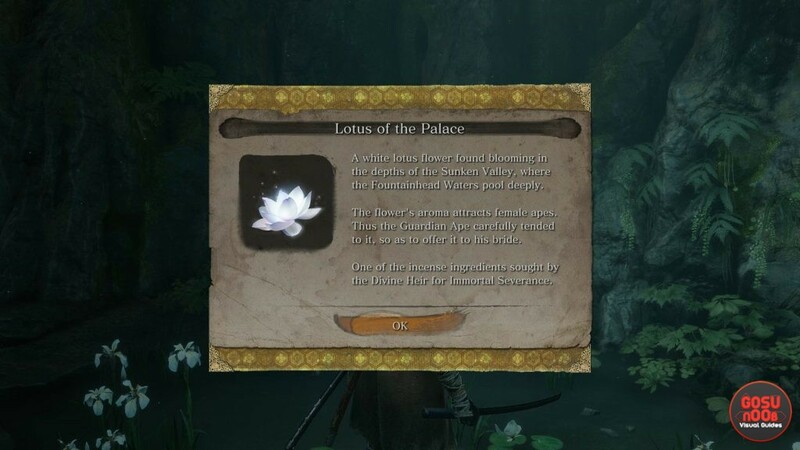 To use the Lotus of the Palace item in Sekiro, you have to take it back to Lord Kuro, and present it to him. As far as we can tell, that’s basically all the use it has. It’s a key item, sure, but you can’t use it on yourself or anything. If it did let you do that, it’d be a problem, given that this is one of the ingredients necessary to craft the Fountainhead Incense. The two other ingredients include the Shelter Stone, as well as something you’ll need the Mortal Blade for. For more on those,, check out our Sekiro Mortal Blade Location – How to Get and Sekiro Stone For Lord Kuro Incense Location.